Directed by former stuntman Nash Edgerton (brother of Joel), this blackly comic thriller aims for Coen-style mayhem but ends up missing the mark. 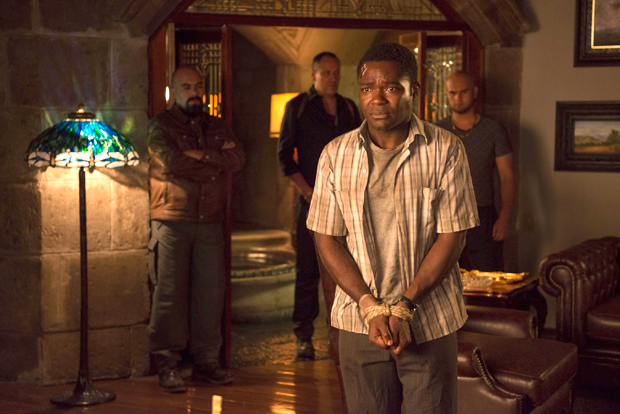 It stars David Oyelowo as Harold, a Nigeria-born American businessman who decides to fake his own kidnapping after uncovering the dirty dealings of his duplicitous bosses (Joel Edgerton and Charlize Theron) while on a work trip to Mexico. However, things spiral quickly out of control and Harold finds himself tangling with dangerous druglords (Carlos Corona as, ahem, The Black Panther), bumbling chancers (Diego Cataño and Rodrigo Corea) and a conflicted former mercenary (Sharlto Copley) as he tries to make it out of Mexico in one piece. For the majority of the film's running time, Edgerton (Nash, not Joel) keeps multiple balls in the air in mildly entertaining fashion, but he drops them all spectacularly before the end, leaving behind an unsatisfactory mess. The main problem is that there are simply too many characters, with Thandie Newton (as Harold's wife) and Amanda Seyfried (as a tourist who helps Harold) both criminally wasted in parts that were surely meant to be more substantial, while an entirely superfluous subplot (involving Harry Treadaway's reluctant drug runner) goes precisely nowhere. The classy cast have a measure of energy that keeps things watchable (Oyelowo makes an appealing lead and Theron is good fun as a sweary, amoral monster), but, as things wear on, there's a sneaking suspicion that Anthony Tambakis and Matthew Stone's script isn't as clever as it thinks it is and the film eventually lurches wildly out of control, abandoning certain characters completely and leaving others stranded in inexplicable plot holes. It's further scuppered by a series of mixed messages and conflicting character motivations that suggest two very different versions of the story have been cobbled together without due care and attention.